Finely moving abilities from design doc to ORK :D and I had some questions about more trickier abilities. 2) Similarly if I want to attack all targets around player in a square grid whats the best setup? 3) I have AOE ability that encourages allies and discourages enemies. Is the best way to do this to have two copies of the ability and cast second one in event of the first one? 4) Battle Range's "Move into position" option does not work on grid right? 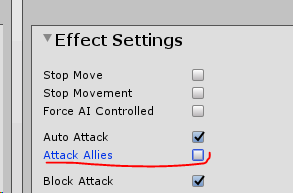 This setting in status effects will force player character into AI mode and auto attack allies? Or only works on AI opponents? 6) Is there an option for Status Effect to end if the combatant the status value is applied to performs action? 1) I don't think this is currently possible, but you can try using the Rotate To Target setting in the target settings (Battle System > Battle Settings). 2) Use a battle range with either a Range or Mask shape type. 3) Either that or simply do the ally (or enemy) changes manually in the event (e.g. using Change Status Effect node). 4) No, it's only for use with the move AI. 5) It also forces player combatants to attack allies, same as Auto Attack just targeting allies. 6) Try setting using the auto remove settings of the effect with an In Action status requirement. For #2 so battle range is the range of cells where I can target combatant right? and affect range is about what cells around target will be affected by ability? So logical problem I have is I need the affect range origin to be player. So the logical step is to use self ability, but that would also make target group player right? So I'm kind of confused how to set affect range origin to be player cell, but target group to be enemies or allies or all combatants (depending on ability). 2) Yes, the use range is the range valid targets can be found, the affect range is the range around targets that will also be affected (i.e. also targets combatants around the original targets). Both use battle range (templates) to define the range - in grid battles, it uses the grid shape settings of a battle range. If all targets around the player should be used, use the Group target range, that'll use all targets within use range. The target type handles which group (allies/enemies) is used. Also, the next update will add some filtering options to the Select Combatant node to only selected enemies or allies of a user, that way you can set up abilities that target all combatants around the user (allies and enemies) and separate the groups in the battle event to do different stuff to them (e.g. damage the enemies and buff the allies). Awesome, that would be great! Thanks. 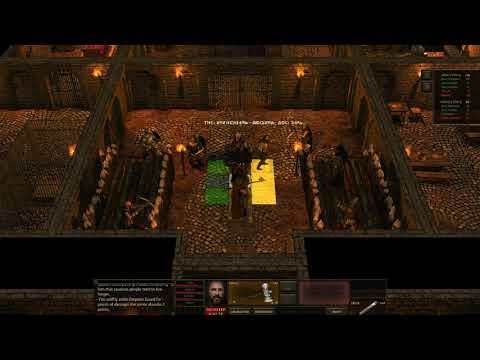 Is there a setting to set target selections effects (Blink/Cursor) to all combatants affected by AOE ability on a grid? For example, if I have a fireball spell that damages everyone within 2 squares of fireball origin, and 3 enemies fall within that ability affect radius. Can I add highlight effects to all? Similar to how target selection of single combatant highlights them? No, the target selection prefab/blinking is only for actually selected targets, not for affect range targets.